When we picture a healthy home, we forget to look at the household cleaning products containing chemicals that are harmful to the human life span. This also affects the surrounding environment. Next, we wish for an invisible fairy to come along and sweep up the mess. Chemicals we use to scent our home, dwell in the air. We breathe the toxic ones in. Toxins in cleaning enter our bodies through ingestion or skin contact. We can also find them making waves in household dust and chemical residue or kitchen utensils. If we dare to flush them down the drain we risk a serious impact on ocean sea life. No prerequisite is required in the U.S. or Canada for manufacturers to give warning to consumers highlighting the environmental and health toxins. 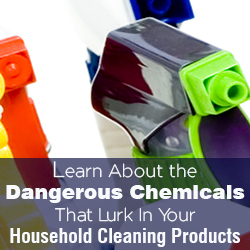 These toxins are in comparison with long-term exposure to chemical elements in household cleansing products. We are exposed to cleansing products and sticky residue in incremental lower levels 24 hours a day. Take heed, chemicals of concern; Many cleaners carry are missing ingredient charts. They provide us with only a sample list of ingredients; it can be life’s challenge to broadcast the chemical effects that are hidden in one’s own closet or cupboard! This eye and skin irritant and neurotoxin is associated with blood disorders. Places where the culprit waits; laundry stain removers, glass cleaners, car cleaners, carpet cleaners, degreasers, rust removers, and windshield wiper fluid. Can mimic estrogen and have reproductive effects on aquatic organisms. Curious places found in: liquid laundry detergents, stain removers, all-purpose cleaners, air fresheners, toilet bowl cleaners, degreasers, and car wash products. Skin irritants such as vapors; affect the throat, lungs, and eyes. Asthma patients may be potently sensitive to the ammonia breathing intake effects. This, in turn, causes liver and kidney damage. Discoveries found in; window cleaning solution, drain cleaners, toilet cleaners, bathroom cleaners, oven cleaners, stainless-steel cleaners, car polish, and all-purpose cleaners. These synthetic dyes have been known to contribute to cancer and these heavy metallic ingredients can be harmful the human nervous system. Startling results found in: most types of household cleaning products, even shampoo. Migraines, allergies, and asthma symptoms often contain harmful irritants. These irritants can build up residue in the ecosystem and can be toxic to oceanic organisms, and are considered to disrupt the endocrine system. These are especially found in: most types of household cleaning products. Mixed with nitrites (which are used as preservatives in other products) form cancer-causing nitrosamines. MEA can also induce asthma. This substance is also harmful to the wildlife and the fish family. This product is typically found in: all-purpose cleaners, liquid laundry soap, floor cleaning solution, dishes soap, car wash products, glass cleaning solution, degreasers, and surface cleaning solution. Landfills containing high concentrations of rain water can create rapid weed inclination, increases algae bloom, and destroys the pretty fish before they can swim to the reservoir. 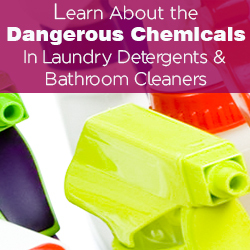 These can be generally found in; dishwasher detergents, bathroom cleaners, and laundry detergents. This compound causes skin sensitivity and irritation; It can also affect allergies, and promote asthma symptoms. You will not want to pour compounds into the environment. They conduct fish toxins. These items are surprisingly found in: all-purpose cleaners, bathroom cleaners, degreasers, and fabric softeners. The International Agency for Research in researching silica powder, discovered it to be a human carcinogen. This naturally made substance. Silica Powder (made from finely ground quartz) is hazardous as a dust particle if you breathe it in. This is additionally found in; cleaning powder abrasives. This type of sodium causes severe skin, eye, and respiratory irritant. It is also known as corrosion. This chemical, taken in high dosages, leads to kidney damage. Sodium is extremely harmful to oceanic organisms. It’s also been known to have lengthy effects in aquatic ocean life. This lye is known to burn the eyes, and cause eye irritation. It affects the human lungs, and skin. Lye is also known to be a respiratory irritation. Air coupled with the long term exposure of lye can lead to skin irritation, and nasal passage ulceration. Caustic soda, if transferred in a large quantity, can transform the water’s Ph balance. This can be observed in: drain openers, oven cleaners, toilet bowl cleaners, and disinfectants. This sulfate appears in dish soap along with other ethylene oxide alcohol additives (hint: look for “eth” in the chemical name). Sulfate can easily become be tainted with 1.4-dioxane. This, in turn, causes cancer, and surrounds the environment. This is often found in: dish soap, cleaning towelettes, and wet cosmetics, regular cosmetics, toilet bowl cleaners, and liquid laundry detergent. This sodium derivative may alter some hormonal functions and is a factor in antibiotic-resistant bacteria. Triclosan can be harmful to wildlife, and fish, as well. This is typically found in: disinfectants, dish soap, as well as a variety of other household cleaning products. It can be listed under the category “active ingredient” in anti-bacterial products. This sodium derivative is a potential human carcinogen. In ocean life, sodium can create sediment in heavy metals. This sodium can then re-dissolve into the environment. These metals are of a toxic nature to fish and other reptiles. This can be mostly found in: laundry detergents and bathroom cleaners (note: this large sodium content is found in industrial formulas).